It was about 2 AM when the fire alarm when off in my hotel room. I have never heard an alarm so loud in my life; all I wanted to do was get out of the room but it was so disorienting that I could barely throw some pants and a shirt on. My instincts told me this was a false alarm as I trudged down 5 flights of stairs to the bottom level. I was behind an elderly couple so it was slow going as we navigated our way out. This particular stairwell brought us out on the side of the building and I noticed it was dimly lit. This was a nice ocean front resort hotel and the lighting in my opinion should have been brighter. About the time I noticed that, the elderly lady in front of me tripped and fell right on her face on the sidewalk. She was about 5 yards in front of me and I was first to her side; she had fallen behind her family. Fortunately a quick responding fire department rolled up right then and I ran over to get their help. They got her up and into the paramedic truck. It looked like the lady was going to be okay but the point is that this was probably avoidable. When I ran to her side I could see the sidewalk tripping hazard that had caused her to fall. Combined with the dim lighting it was a case of dual premises liability. I give talks to groups like IFMA and BOMA just on the topic of Tripping Hazards and Premises Liability. The numbers are staggering when you look at the amount of incidents and the costs associated with them. The toll is financial: lawsuits, settlements, workers comp, bad press. And the toll is physical: injury and sometimes death. This is the cost of not knowing that you may have tripping hazards on your property; or worse it is the case of knowing and not doing anything about it. Those factors weigh heavily in court. The ADA says a sidewalk more than a 1/4" out of level constitutes a tripping hazard and requires a ramp to be installed. OSHA has falling as one of the leading (if not THE leading) cause of death in the workplace; with the majority being falls from ground level as opposed to falls from a height. Finally, DOT studies show that people's feet clear the ground by a mere 1/8" while walking. That's why it is so easy to trip over something you can't see. It's also much easier to look up "slab lifting" on the internet and find Alchemy Spetec on page 1. 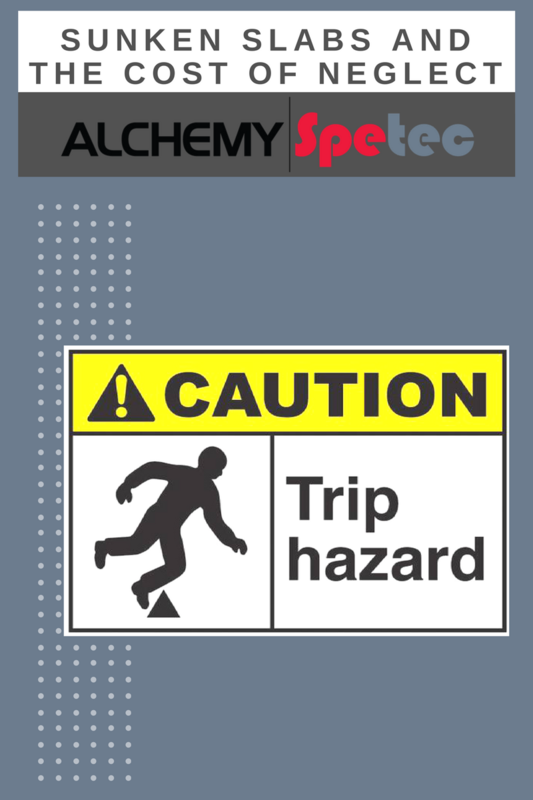 There you can learn how the Alchemy line of Slab Lifting and Soil Stabilizing products can solve your tripping hazards rapidly and permanently. We've got your back!